ESPN's Curt Schilling | Public Advocate of the U.S.
Public Advocate president Eugene Delgaudio said "Curt Schilling is standing up for first amendment rights as an American to comment on social issues pushed by the politically correct nazies. We proudly award him the Family Advocate Award." 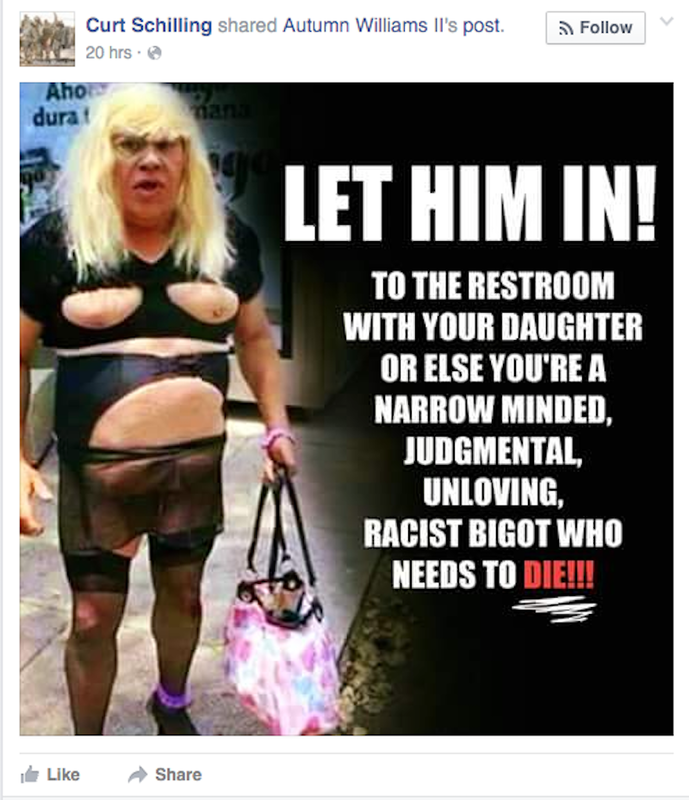 One week after being fired from ESPN after commenting on and promoting a controversial anti-transgender meme on his Facebook page, Curt Schilling is firing back at his former employers. In a one-hour guest appearance on SiriusXM Satellite Radio's "Breitbart News Patriot Forum," the former pitcher-turned-analyst flatly accused the sports network of being biased against political conservatives and having inconsistent standards when it comes to reprimanding on-air talent. According to Newsday, Schilling's commentary was recorded on Wednesday afternoon and is scheduled to air at 8 a.m. Thursday morning. Here's just a sampling of what he had to say. "It was apparent to me early on that if you wanted to go off topic as a sports person you had to go off topic left, or you were going to get in trouble." "Some of the most racist things I've ever heard have come out of people that are on the air at ESPN. They're some of the biggest racists in sports commentating." THIS IS THE " CRIME " IN WHICH SCHILLING SHARED A TWEET WHICH MILLIONS DO EVERY DAY.